MBaaS, or Mobile Backend as a Service, seems to be a particularly hot topic these days. MBaaS generally refers to backend services for mobile applications that provides data storage, user management, push notifications, and other pertinent mobile APIs. Bluemix is an open-standards, cloud-based platform for building, managing, and running apps of all types, such as web, mobile, big data, and smart devices. Capabilities include Java, mobile back-end development, and application monitoring, as well as features from ecosystem partners and open source—all provided as-a-service in the cloud. 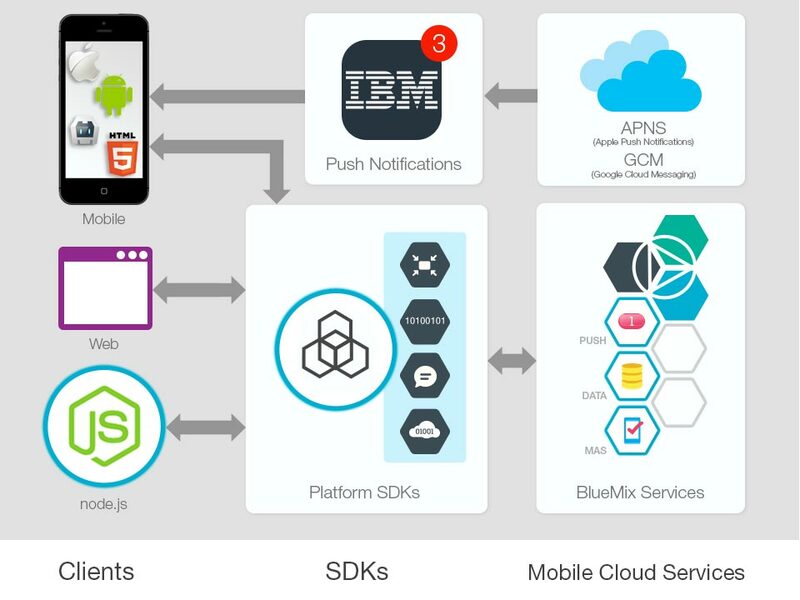 You can view the full catalog of Bluemix service offerings here. Rather, MBaaS back-ends include services for data management, user management, notifications, and possibly more depending on the provider – all geared towards powering applications on mobile devices. Why is it a hot topic? MBaaS enables growth of mobile applications with seamless (and virtually endless) scalability, all without having to manage individual systems for the application server, database, identify management, push notifications, or platform-specific services. I’ve been writing a lot about IBM MobileFirst lately for a seamless API to deliver mobile apps to multiple platforms; though it has been in the context of an on-premise installation. However, did you know that many of the exact same MobileFirst features are available as MBaaS services on IBM Bluemix? IBM’s Mobile Cloud Services includes device management, user authentication, offline and back-end data storage, push notifications, operational analytics, and provides APIs for native iOS, native Android, hybrid apps, web apps, and even node.js clients for custom backend services. Mobile Data – The mobile data service includes a NOSQL database (powered by IBM Cloudant), file storage capabilities, and appropriate management and analytics features to measure the number of calls, storage usage, time/activity, and OS distribution. Push Notifications – The push notification service allows you to easily push data to the right people at the right time on either Apple APNS or Google GCM platforms – all with a single API. Notifications can be sent by either an app or backend system, and can be sent to a single device, or a group of devices based on their tags/subscriptions. Of course, with appropriate analytics for monitoring activity, distribution, and engagement. Mobile Application Security – The mobile application security service enables you to provision or block any devices and/or users using your application, provides user authentication, and provides analytics for app/device usage, OS distribution, and time/activity. Many of these are the exact same features that you can host in your own on-premise IBM MobileFirst Platform Foundation server – the difference is that you don’t have to maintain the infrastructure. You can scale as needed through the Bluemix cloud offering. Andrew is a Developer Advocate for IBM. Disclaimer: This blog contains my personal thoughts and not those of my employer. Is that me on the company home page? IBM MobileFirst Platform Foundation 8.0 Beta Now Available!